Gammera the Invincible (1966) Review – AiPT! I’m aware of the spelling in the title. I hate it as much as you do. Anyway, Gamera (yeah, I’m gonna spell it this way, now) will forever be recognized as “that guy that isn’t as good as Godzilla”. A fair and accurate moniker, at least in regards to the Showa series of Gamera films, as they were all pretty awful (five of them were granted the Mystery Science Theater 3000 treatment, after all). Still, awful as the Showa Gamera series is, it can still be entertaining when it’s totally reveling in its own absurdity. Most of the later films understood this and became progressively more bizarre, but such is not the case with Gammera the Invincible, the first film in the series. This opening chapter plays things up straight as can be and suffers all the more for it. After a US fighter jet shoots down a Soviet plane carrying a small atomic warhead over the North Pole, the resulting explosion frees the legendary Gamera from his icy tomb. A relic from a time when giant monsters breathed the sulfur of Earth’s atmosphere, Gamera flies around the globe, devouring great heat sources wherever he should find them, destroying cities along the way. As the nations of the world do all in their power to try and stop the monster, little Toshio (Yoshiro Uchida) just wants to be Gamera’s best buddy. As you may be well aware, Gammera the Invincible is actually an American edit of the 1965 film, Gamera the Giant Monster (it also marks the only time where the giant turtle sported two ‘m’s in his name). I must warn you: Godzilla, King of the Monsters! it most certainly is not. Gammera the Invincible mostly shoehorns in dull, useless scenes of American brass bickering back and forth about, at first, whether or not Gamera is real, and later, what exactly they should do to stop this menace. These sequences are as boring as you can imagine and don’t feature any main characters to latch onto, consisting primarily of a rotating cast of government officials and TV personalities. I suppose that’s not entirely true; Brian Donlevy plays General Arnold during the first few scenes of the movie while Albert Dekker plays the Secretary of Defense. You probably don’t recognize either of them, but they were popular back in their day. The Japanese cast is shuffled off to the side for the first half of the movie. After the midway point, once the torch is passed to them, you can barely remember who any of them are or why they matter. Little Toshio gets more screentime than anybody else, as he’s psychotically determined to prove that Gamera is a friend to all children. Sorry, kid, but that angle doesn’t show up until the third movie. The little brat can wane on your patience, that’s for sure. So what is it that gave Gamera such lasting power? Is it the kaiju-himself? Dude, he’s a giant rocket-powered turtle that breathes fire. I don’t know about you, but I think that’s pretty awesome. While in some shots, when he’s walking about on his hind legs, he can tend to look like a giant mobile waffle, the design for Gamera is really pretty inspired; from his tusks, to his serrated shell, to his mechanically-controlled eyeballs. His firebreathing effects look especially good as Daiei chose to forgo animating the blasts, ala Godzilla’s atomic breath, and instead chose to just shove a flamethrower down his throat. Hey, whatever works. The production value of the Gamera films are pretty bottom line, what with this first film being shot in black and white while the more respectable Godzilla series had long since moved onto color. Most of the model work looks utterly ridiculous, particularly the jet fighters. You can tell Daiei didn’t have an Eiji Tsubaraya of its own. 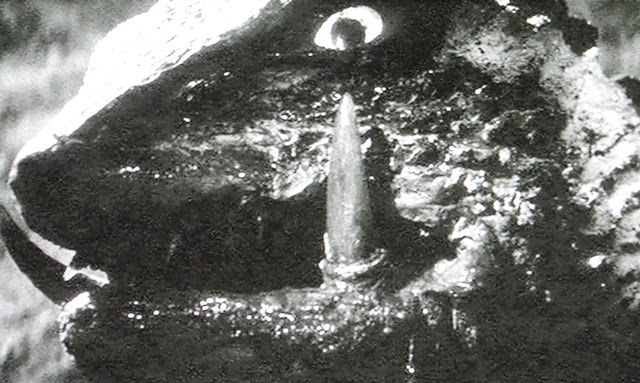 There are a few grand shots, such as when Gamera attacks the geothermal power plant or the oil refinery, but most of the effects work is pretty bogus, even for the era in which the movie was made. I have to admit that I love the way they defeat Gamera at the film’s conclusion. (Um…spoilers…?) So, almost completely out of nowhere, they just decide to throw Gamera into a spaceship and blast him off to Mars. Problem solved! It’s incredibly silly and random, but as I said before, Gamera movies are best when they lay the whacky on nice and thick. Gammera the Invincible certainly isn’t a tremendous first effort for the series, making one wonder how it gained such everlasting popularity in the first place. And the lifeless new scenes added to this American reworking of the film only help to make things worse. Still, you get a giant rocket-powered turtle, so it’s got that going for it.